This is the first time that I tried to cook this recipe. I didn’t achieve the dark brown color like the ones being sold from my fave dim sum outlet. But the taste, according to hubby, is just as “good”. I got the recipe from Panlasang Pinoy but I made a little variation (for lack of some of the ingredients or garnishings). 1. Instead of frying the chicken feet I let them boil in a pan of water until tender. 2. 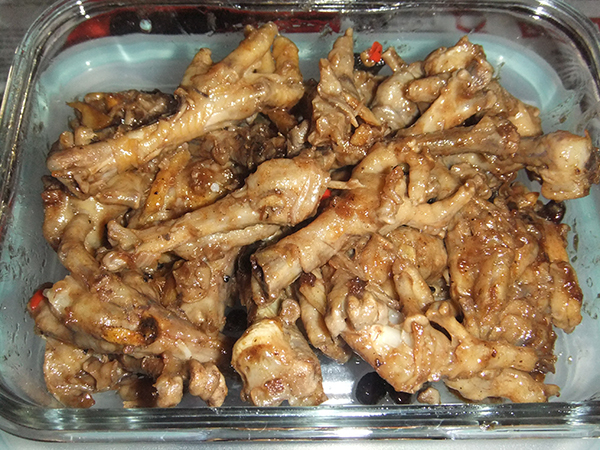 Saute the garlic and ginger in cooking oil, add the chicken feet, oyster sauce, soy sauce and black beans. 3. Add the sugar, chili, and diluted cornstarch. Mixed well and let it simmer until the sauce thickens. 4. Serve with rice or your favorite beverage as this is also best for “pulutan”. This entry was posted in Favorite Food, Recipe and tagged spicy chicken feet, spicy chicken feet recipe on March 2, 2018 by Yami.